There have been very few movies in my life that I've watched on such a regular basis as the Jason Bourne trilogy. There are even fewer movies that I'll play segments of over and over again, just to hear the soundtrack. The Bourne Identity/Supremacy/Ultimatum are just such movies for me. John Powell is the ridiculously-gifted composer behind over 40 movies, including X-Men: The Last Stand, Mr. & Mrs. Smith, and the Bourne Identity trilogy. 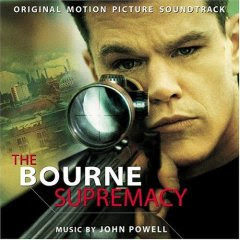 The Bourne Supremacy soundtrack is top of them all, in my opinion. The movie itself raked in an easy $176.2 million dollars in the US, $288.5 million worldwide. And the movie would not be what it is without John Powell's genius. He so accurately expresses emotions and sequences of action in melody and rhythm that he tells the whole story on an almost subconscious level. I don't really have a point, I guess (no spiritual parallels or "ah ha" moments). It's just definitely worth the $10 download- especially if you liked the movies.